Awesome catch of big wahoo on our sportfishing charter. It’s March and that means its the beginning of our best fishing season of the year. Early March got off to a rocky start with lots of good trips, but also a few slow fishing days mixed in where we couldn’t get a bite no matter what we tried. That’s why it’s called fishing and not catching! 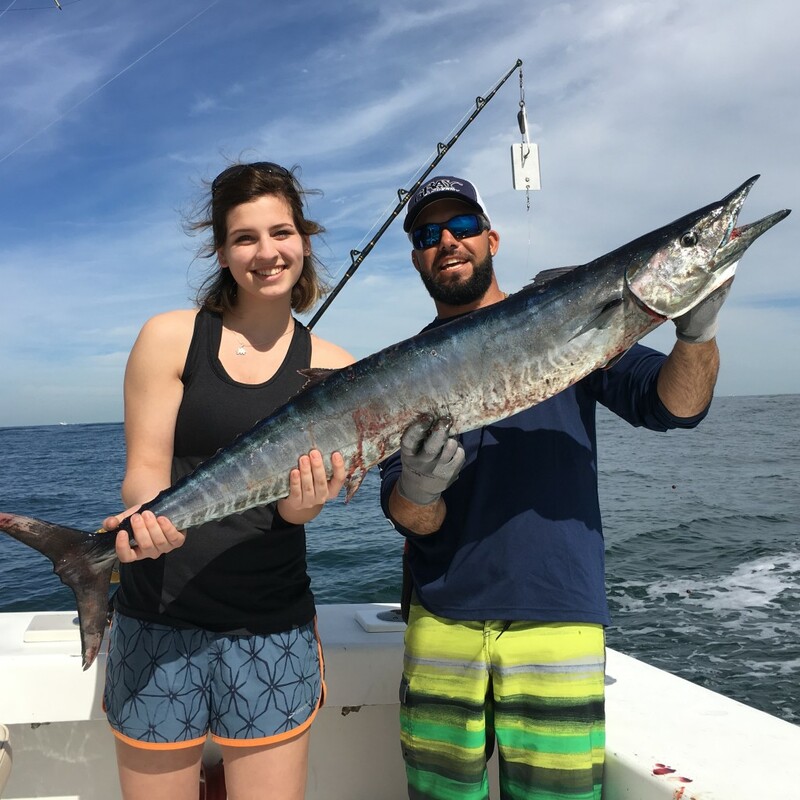 But the majority of our fishing charters had good results with mixed catches of kingfish, mahi-mahi, some really big wahoos, a few sailfish and bottom fish. Nice dolphin caught on the reef on our drift fishing trip. First off, our drift fishing trips are catching good numbers of yellowtail and mangrove snappers. These delicious snappers generally make up the majority of our catch, along with some larger mutton snappers and even a couple groupers mixed in. Good numbers of other small bottom fish including porgies, grunts, triggerfish and blue runners are being caught as well. The day trips are also getting into a few mahi-mahi, kingfish and bonitos as well. These are the larger fish that we catch on the drift boat, complimenting our main snapper catches. There is ALWAYS a couple weeks in March and/or April when the wind blows strongly out of the east when the big mahi-mahi come right in on the reef to spawn. They are the larger mahi-mahi, generally 10-25 pounds, sometimes even larger. They bite best on the roughest days so don’t shy away if it’s a strong east wind and high seas. These turbulent days are best days to catch fish. 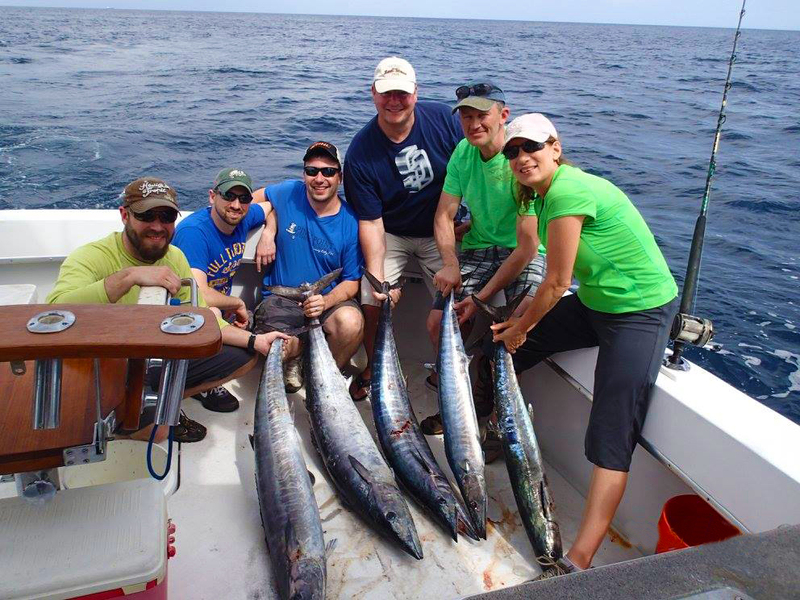 Our private and shared sport fishing charters continue to be the best trips to catch the biggest fish. This month is great for mahi-mahi, tuna, wahoo, sharks, sailfish, amberjacks and cobia. Watch for the strong east wind (when the ocean is rough) for the good mahi-mahi bite this month. 2-3 days in a row of strong east winds is what you are looking for and when it happens, the dolphin fishing gets extremely good. The past 2 weeks have been awesome for wahoo fishing! The big wahoos are snapping on the outside edge of the reef. The best way to catch these is by trolling (dragging lures around and trying to cover as much territory as you can). Or another great technique is to ‘slow-troll’ live baits out of the outriggers and drag them slowly over the zone you are trying to cover. Both of these fishing techniques have had great success this past week on some big wahoos. 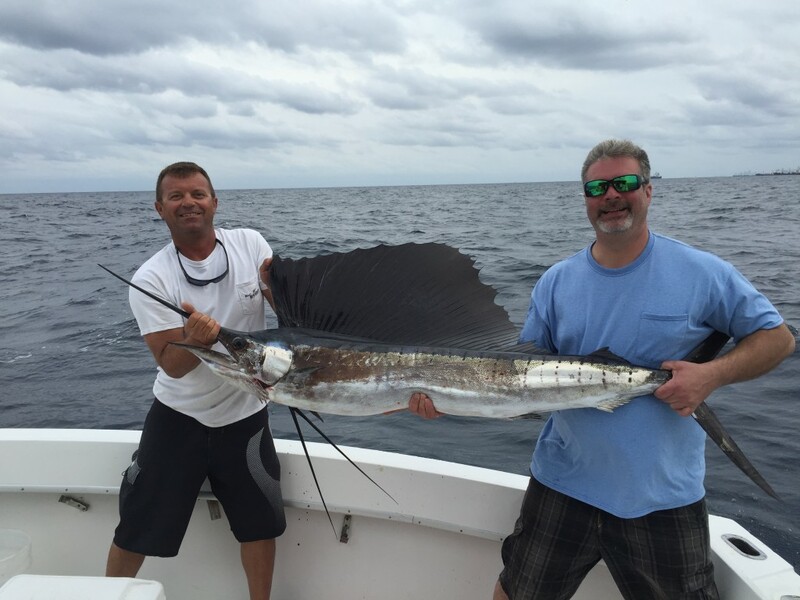 Nice sailfish caught on our fishing charter in Ft Lauderdale. Although it isn’t the best season of the year for sailfish (winter is the best), there are still good numbers of sailfish being caught. We don’t get them every day but the potential is certainly there. 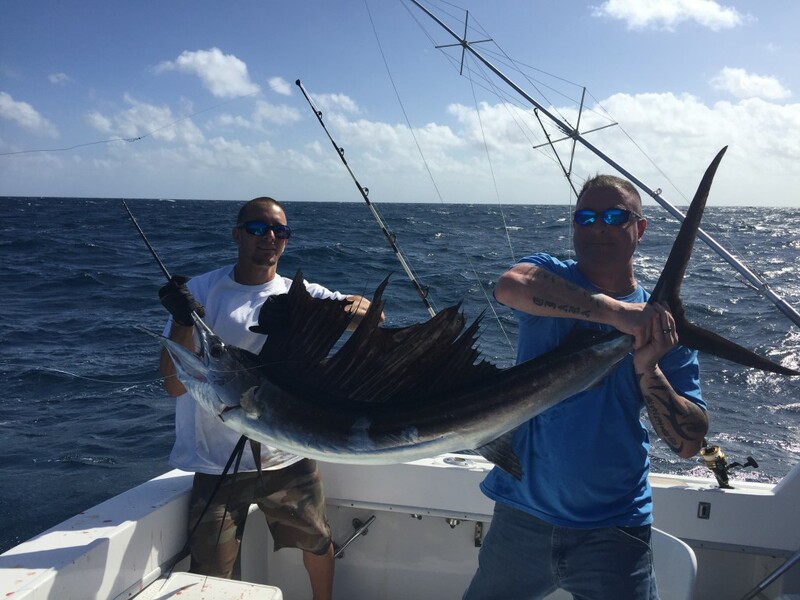 Sailfish are the most sought after gamefish in the world and Ft Lauderdale has some of the best sailfishing in the Atlantic. Kite fishing is the technique of choice to go after sailfish, where we fly kites behind the boat and use the kites to suspend the live baits so the baits are kept splashing on the surface making ‘fish-in-distress’ vibrations. Watching a sailfish come up and seeing the whole bite sequence using fishing kites is amazing. You can catch any of the surface feeding gamefish using the kite fishing technique. Wreck fishing. It’s just getting started but over the course of the next few months, the wrecks are going to be holding a lot of the biggest fish in our area. Mid March through June is the season for amberjacks, grouper, cobia and barracuda around our 200-300ft shipwrecks. Back in the 80’s and 90’s, Ft Lauderdale had a big artificial reef program and sank A LOT of retired ships in these depths, to create habitat for fish to congregate around. It worked! Since then, we have had an excellent bottom fish fishery here in Lauderdale. We love to shipwreck fish because you drop a bait down to the bottom and can be hooked up to a big game fish in seconds. Fish around the shipwrecks are very aggressive (because so much competition for food from other big fish). If a live bait dropped near a shipwreck comes near to any big game fish, they inhale it instantly. This is good for us because with the 3-4 knot average current of the Gulfstream, we don’t get but a couple minutes of bottom-time when we are dropping deep baits around the wrecks. 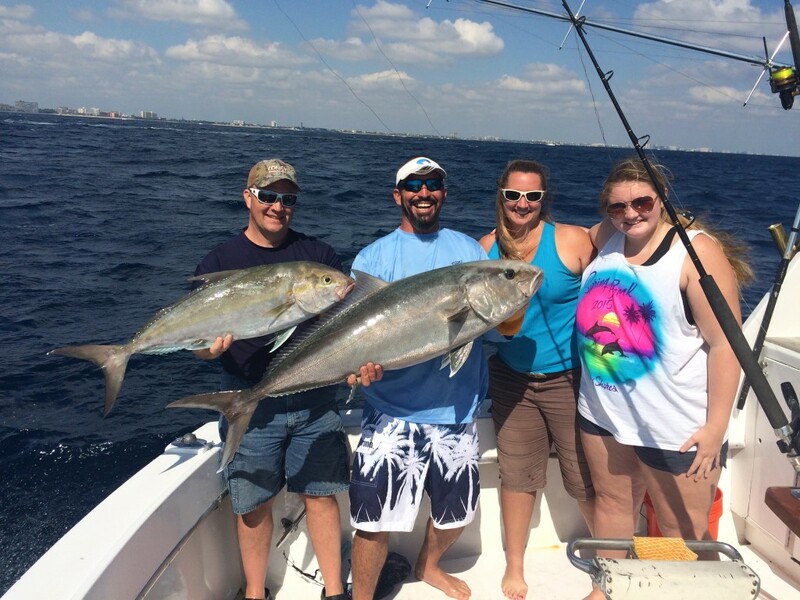 Amberjacks are one of the strongest fish in the ocean pound for pound, and they are a lot of pounds! They put up a world class gamefish fight. 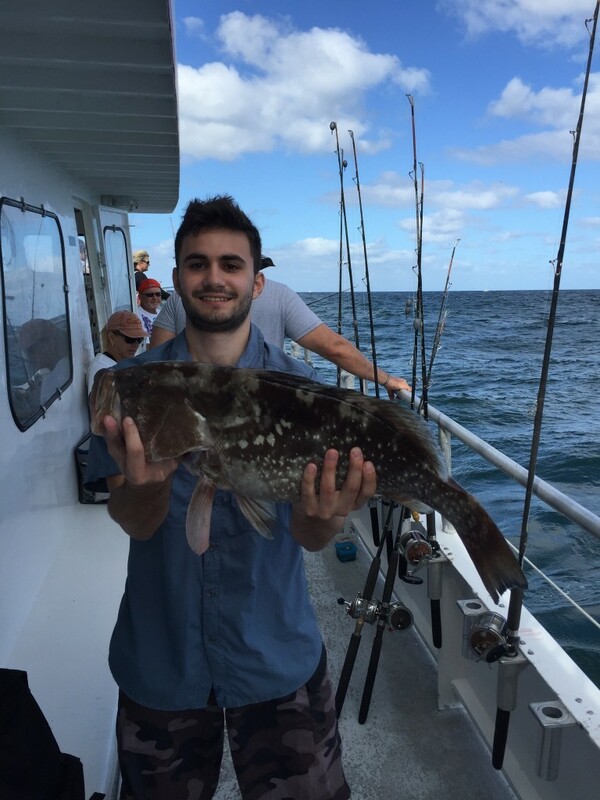 Groupers and cobia don’t fight quite as hard but sure are exhilarating to catch. Barracudas and sharks also patrol these wrecks for a quick meal, so there is a lot of variety and good sized fish to catch here. Shark fishing is also getting into full swing. The absolute biggest fish to catch in our waters are sharks and March is the start of our annual shark migration off our coastline. We call it the ‘Shark Train’. Chooo-Chooo, the shark train is coming through. Already we’re catching some monster hammerhead sharks, tiger sharks and others and it’s just getting started. Expect a lot of monster sharks to be caught over the next few months. Every year, there are more and more sharks coming through. With no natural predators, the shark populations seem to be increasing dramatically every single year over the past decade. Look at some of the helicopter footage and you can see the sheer numbers of sharks swimming through our waters- it’s crazy. Don’t worry swimmers, sharks don’t naturally eat people. Shark attacks are almost ALWAYS a case of mistaken identity, or some idiot diver/spear-fisherman doing something dumb. 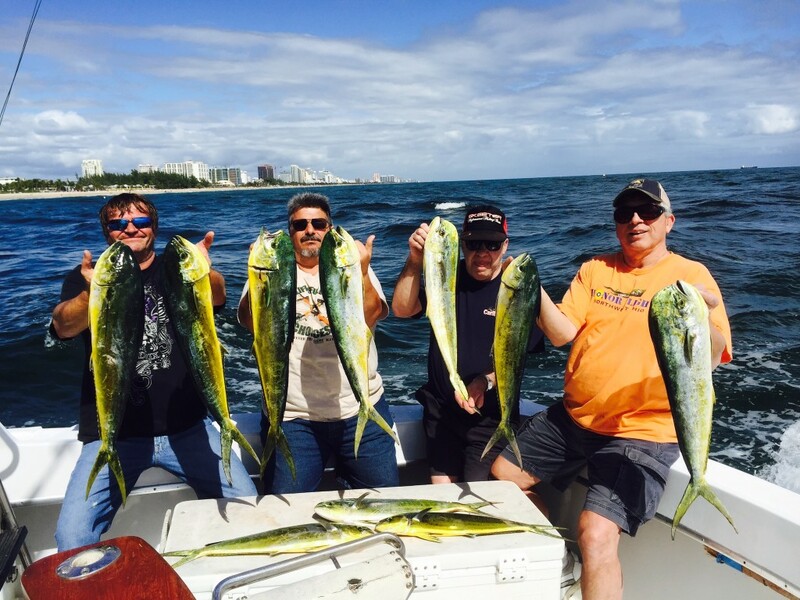 We are Fort Lauderdale’s BEST shark fishermen, it’s one of our specialties, so if you would like to go after a gamefish bigger than you are, try a private fishing charter and tell us you’d like to fish for sharks. We don’t catch these very often. 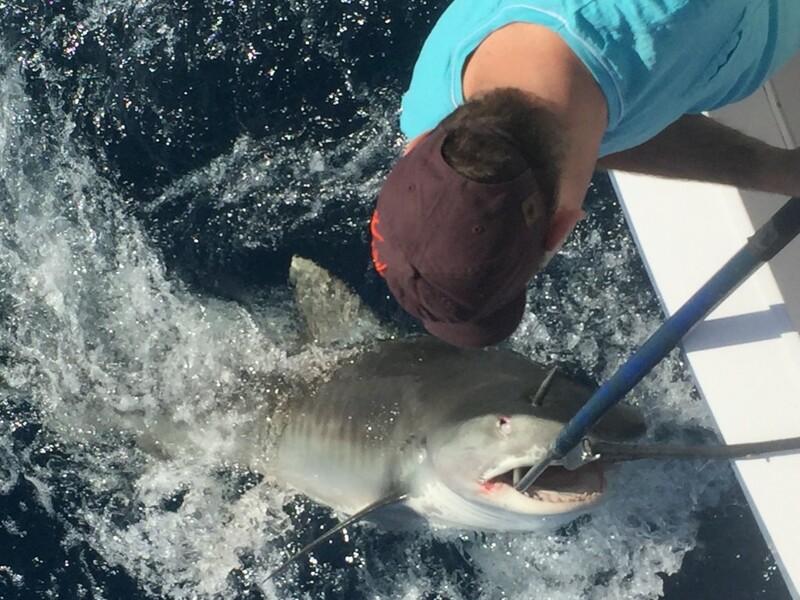 Huge tiger shark caught on a shark fishing charter. There’s a great variety of big fish moving through Fort Lauderdale and late March is usually when the best bite of the year begins. Good luck out there fishing and I hope you catch a big one! I’ll sea ya on the water. 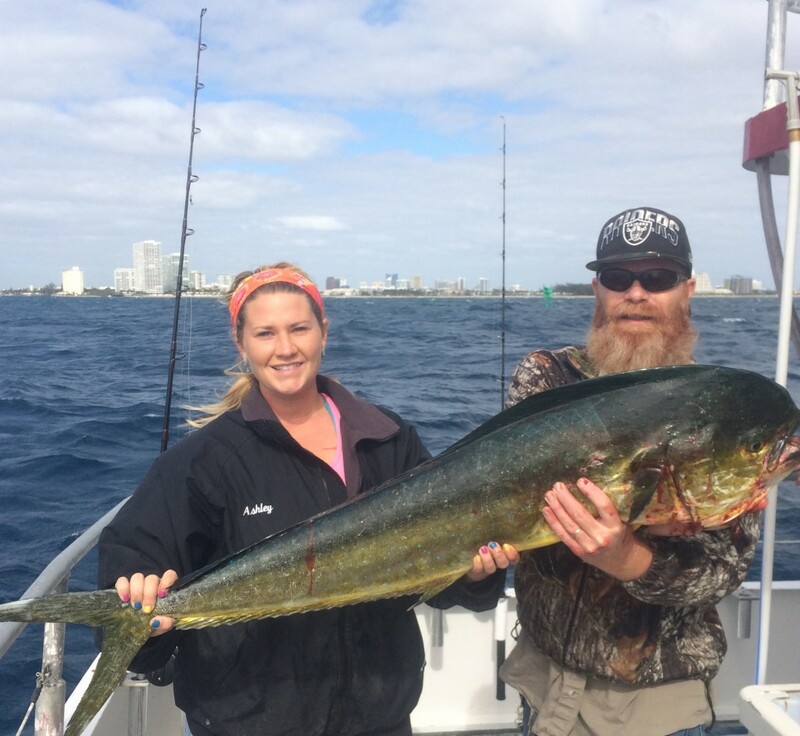 The Best Season of the Year for Fishing Ft Lauderdale is Here! 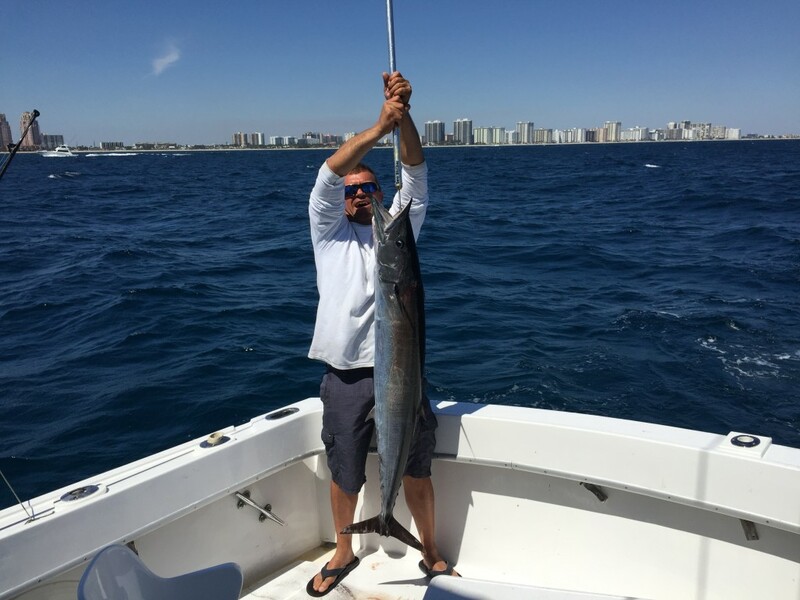 Nice wahoo caught deep water trolling in Ft Lauderdale. March is here! The best season of the year is upon us and the fish are starting to bite. Fishing has improved dramatically over the past 2 weeks. March, April and May are the best fishing months in Fort Lauderdale and we have been looking forward to this for a long time. This is the season where everything is biting. Trolling, live baiting, shipwreck fishing….. they are all equally good this time of year and doing any one of them can yield an epic fish. The action on big fish is probably most attributed to the large amount of small tunas on the reefs. It’s the circle of life and the multitude of tunas creates a plentiful food source, which brings in the big game fish. From tunas to blue marlin, there isn’t anything that swims offshore of south Florida that isn’t biting over the next 3 months. Dolphin are biting this month. They are scattered out there so any day is a possibility of finding them, but any day there is a strong east wind, it is probable that you find them. Dolphin are traditionally an offshore fish. But during the month of March and sometimes April, the East wind brings the big dolphin into 100-200ft of water. These are not the schoolie size, little ones we catch during the summer months. These are the bigger dolphin, the majority of them in the 12-20 pound range. If the East wind blows for a few days straight, especially when it blows really hard and the ocean gets rough, the dolphin start snapping! It is the best bite of the year and it is just a mile offshore. I wait the whole year to fish those few days. Basically, the rougher the weather, the better the dolphin fishing gets. Nice pair of Jacks caught deep dropping over a shipwreck. Wreck fishing deserves it’s own fishing report. The wreck fishing is so good over the next couple months. Amberjacks, almaco jacks, grouper, snapper, cobia and barracuda all take up residence (in concentrated numbers) on our deep wrecks this season. Jack fishing is incredibly fun. Amberjacks are the strongest fish in the ocean pound for pound. Their powerhouse strength and voracious appetite make jacks a great target fish to go after. They are beginning to show up on the 200-300ft deep shipwreck off our coast and their numbers will grow over the next month. These jacks are very aggressive and will fight for any available food they find. If you drop a bait down atop a shipwreck, if it doesn’t get eaten in the first 3 minutes, it’s best to reel in and go to another spot. Jacks do not let a bait sit unscathed for even a second. They inhale their prey, swallowing it whole, instantly on-sight. It is still in the beginning stages for wreck fishing off south Florida, but in another 2 weeks, wreck fishing will be superb. 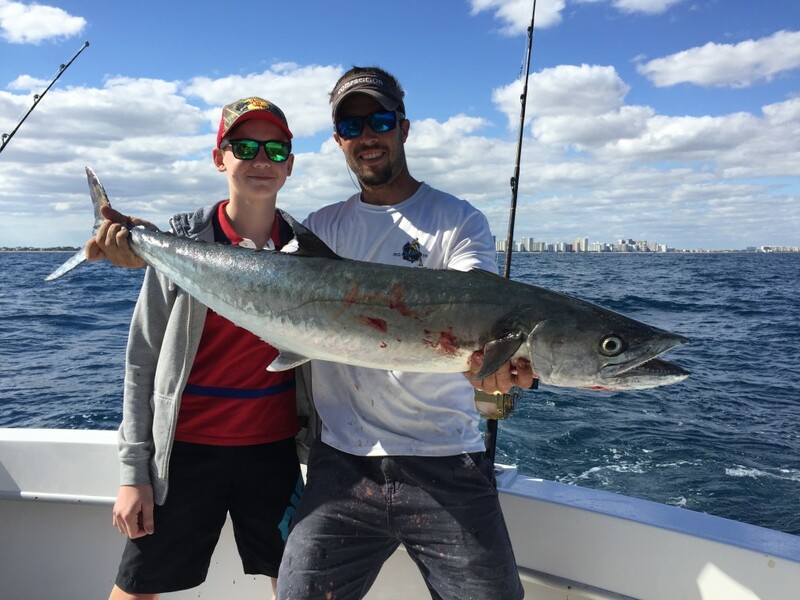 A really big kingfish caught live baiting on the Ft Lauderdale reef. Trolling the reef is also a great way to fish in March. In fact, its the best way to get all-around action. Trolling is such an effective technique because you are so mobile. You can troll different depths, different fishing zones and move around from area to area. Most importantly, we can listen to the radio and hear where the best bite is going on and go there. Trolling allows versatility. Not to mention that it is the best way to catch lots of fish. Reef trolling is great this month for catching kingfish, blackfin tuna, barracuda, bonito and sometimes a wahoo. 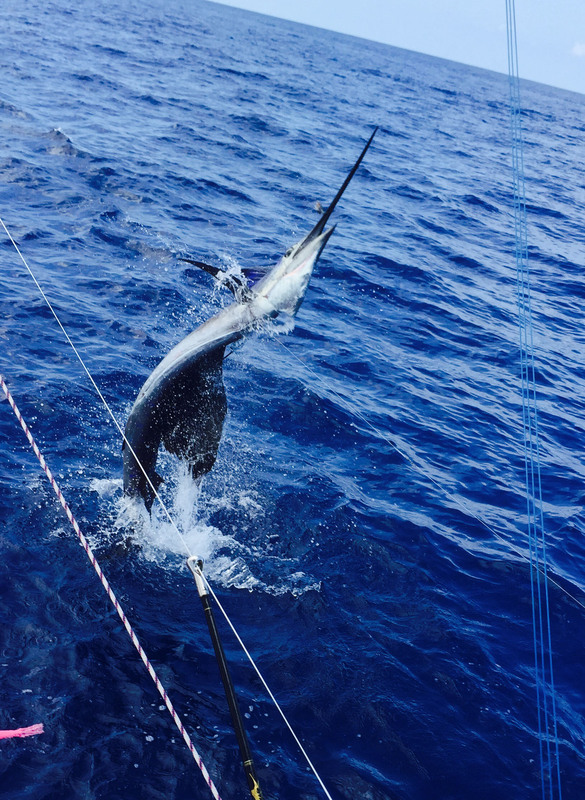 You even have a chance at sailfish, even though sailfish action is starting to trail off this month. You can catch anything trolling and/or drift fishing on the reef. Our drift boat, which mainly fishes the reef, catches a lot of big kingfish this time of year along with healthy numbers of snappers and grouper. Speaking of drift fishing, our drift boat catches of mutton snappers have gotten surprisingly good this week. As you can see, it’s a great time of year for everything. We’ve been looking forward to this good fishing for a while with the relatively slow January and February fishing these past couple months. Great shot of a sailfish jumping right next to the boat. Anything can happen this time of year and it does! You can be fishing without a bite for 2 hours and suddenly you’re hooked up to a once-in-a-lifetime gamefish. This month is the Gold Rush for all our best fish of the year. So get out there and catch yourself a sea monster. Good luck fishing out there over the next couple weeks. I’ll sea ya on the water.